Okay so to start out, this is my first guide for smite, i did one for league a while back on a different site so be nice please. secondly this build is to maximize Ao Kuang's Passive graceful winds. this gives you extra magical power for a percentage of your mana. add this with book of thoth's passive that also gives you power for mana percentage. From there on out you just max out mana items. okay, to start out you get standard start of boots of the magi. I usually get rank one in the boots get both my actives (or just one), then use the rest of my money on pots. (equal amount in both hp and mana pots). the reason for this is that although this build will make you sort of hard to kill near the end early game you are very weak and i like to play safe and farm up. secondly you get the main item of the build, Book of thoth. After you complete this you will need to farm alot in order to get the full 50 stacks which give you increased mana and in turn more magical power. After getting this you want to pick up the warlocks sash to add to your mana pool and give you some tankyness. you are gonna need to farm so more to get full stacks on this as well. next you want gem of isolation mainly for the mana but also to add some more hp and magical power, plus the slow is quite nice as well. After that or before the gem of iso (i prefer gem first) to give you alot of hp and mana get the Ethereal staff. Now i know "its for ap tanks only why would you get that" is what i hear alot. But if you look at its passive combined with your other items and your passive it gives you a lot of magical power. Lastly you obviously should get the Rod of Tahuti. Why not another mana heavy item? because the math with the 25% more AP ads up to more magical power. All in all this build gives you around 1k ability power as shown in the screenshot above, also you probably wont ever have to back for mana and you wont be easy to take down with so much life. Actives are standard Beads, Aegis combo because you can never be too safe, sprint is also an option for those who prefer it. Make sure to buy lots of wards for your team obviously and early game some mana and hp pots. late game after your full build make sure to always have a purple pot (magical might) running so you get that extra umph. To start off, get your Tornado first. this allows you to farm efficiently and it does the most damage. Don't get your slither till after you get your first level in your ultimate because you should be farming anyways not getting into fights where that is needed. Max your tornado as soon as possible after level 6 and same with your ult. After you tornado is maxed, max your squall first and lastly your slither. A tip o clearing the whole wave with 1 tornado is to put it in front of the enemies creep wave right as it is coming to the tower line. (the outer line closest to you not the one closer to their base) You will probably have to auto attack the large cyclops minion a couple times early game to kill it since it has a lot of hp. Use your squall to harass since you can clear a wave with 1 tornado, early game though you will use this to clear the minions along with your tornado. Overall the theme of this build is to farm. Try to get into team fights as little as possible till you reach your third level on the gem of isolation. Make sure to let your team know so they don't assume you will come, and they will not get mad at you when you don't come. (obviously you should go if you can but try to not if you notice you won't be able to help much.) Make sure to push the wave to your enemies tower and then dip into the jungle and get red buff (damage) and the exp camp (the 3 gold furies), and if left lane doesn't need blue buff (mana regen). this will let you get stacks faster and allow you to bully your lane opponent more and maybe get some kills. Snowball builds (build that include items that gain stacks) are the best type for Ao Kuang and yours is moderately good. I don't like Ethereal Staff here much, I really don't. Sure, it'll make him a bit tankier but with an item like Void Stone, you can drop a Tornadoes right under you if you're in trouble and usually walk out with a kill, or scare the hell out of someone. You've got a wall of text here. I would recommend adding some color, picking out main points and making them pop for the reader. Also concerning the build, I prefer that Warlock's Sash should be built before Book of Thoth when I play him (he's the God I'm learning now), since there are more stacks on the first and therefore while you're 30-40 stacks into the Sash you can finish the Book and finish all of the stacks around the same time. Rod of Smack-Yo-Booty I prefer to build 4th or 5th, to really take advantage of it. Remember that this is all my opinion. Feel free to do as you wish, but this beith mine suggestions. I do like that you added the full stats, good job on that. Keep working on it and you could have a good guide running here. "Beith"? Fancy. I agree about the Warlock's Sash first, 100 stacks vs 50 is a no-brainer. Personally i do not care for the stasis spell (LoL reference). Personally i prefer Combat Blink, since he has no escape. 26896 Sirsir94 [quote=JararoNatsu] Snowball builds (build that include items that gain stacks) are the best type for Ao Kuang and yours is moderately good. I don't like [[Ethereal Staff]] here much, I really don't. Sure, it'll make him a bit tankier but with an item like [[Void Stone]], you can drop a [[Tornadoes]] right under you if you're in trouble and usually walk out with a kill, or scare the hell out of someone. You've got a wall of text here. I would recommend adding some color, picking out main points and making them pop for the reader. Also concerning the build, I prefer that [[Warlock's Sash]] should be built before [[Book of Thoth]] when I play him (he's the God I'm learning now), since there are more stacks on the first and therefore while you're 30-40 stacks into the Sash you can finish the Book and finish all of the stacks around the same time. Rod of Smack-Yo-Booty I prefer to build 4th or 5th, to really take advantage of it. Remember that this is all my opinion. Feel free to do as you wish, but this beith mine suggestions. I do like that you added the full stats, good job on that. Keep working on it and you could have a good guide running here. [/quote] "Beith"? Fancy. I agree about the [[Warlock's Sash]] first, 100 stacks vs 50 is a no-brainer. Personally i do not care for the stasis spell (LoL reference). Personally i prefer [[Combat Blink]], since he has no escape. 15429 JararoNatsu Snowball builds (build that include items that gain stacks) are the best type for Ao Kuang and yours is moderately good. I don't like [[Ethereal Staff]] here much, I really don't. Sure, it'll make him a bit tankier but with an item like [[Void Stone]], you can drop a [[Tornadoes]] right under you if you're in trouble and usually walk out with a kill, or scare the hell out of someone. You've got a wall of text here. I would recommend adding some color, picking out main points and making them pop for the reader. Also concerning the build, I prefer that [[Warlock's Sash]] should be built before [[Book of Thoth]] when I play him (he's the God I'm learning now), since there are more stacks on the first and therefore while you're 30-40 stacks into the Sash you can finish the Book and finish all of the stacks around the same time. Rod of Smack-Yo-Booty I prefer to build 4th or 5th, to really take advantage of it. Remember that this is all my opinion. Feel free to do as you wish, but this beith mine suggestions. I do like that you added the full stats, good job on that. Keep working on it and you could have a good guide running here. assuming this guide is made to allow you to fight close range, because you lose some dmg for it, its nice it would work, not my playstyle but does work =) i would say get creeping curse as well, keeps enemies even longer inside your tornadoes when they jump at you, i wouldnt get both aegis and beads, its way way overkill i think ive only ever needed that kinda defense like twice in my career. if they have hades or ares get beads then i would say either girdle or meditation, med lvl 3 heal is pretty nice for a spot heal and will help more then defense. other then that, more information! you actually get more damage with this build than building straight damage because of ao kuang's passive and the book of thoth passive. add in ethereal staff passive combined with the other hp items that give you mana as well and you end up with the most magical power for ao kuang. 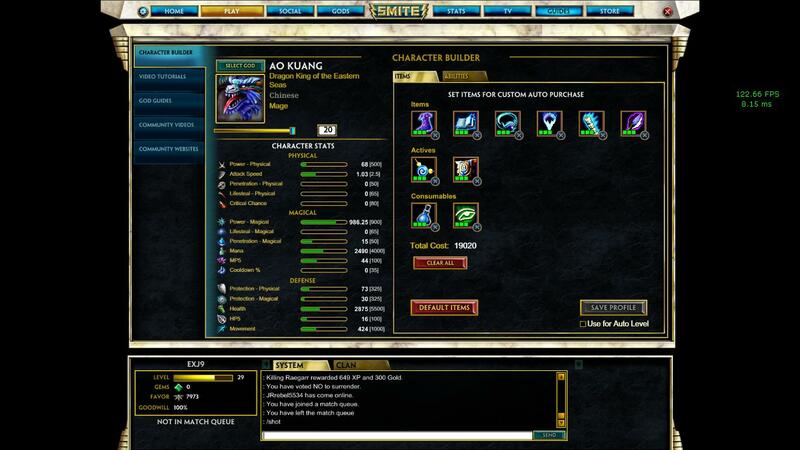 also it doesnt require you to be up close because of ao kuang's abilities. you just sit outside of a fight and pop tornadoes and squall. also beads aegis is really safe for someone like ao kuang with no real escape. i wouldnt recomend meditation because late game its pretty useless and most of the time you need beads or aegis more than it. other actives you can get would be sprint or girdle i guess. the reason you dont want creeping curse is because you shouldnt be close enough to the fight to be able to use it properly. 14121 Exj9 [quote=Kaden] assuming this guide is made to allow you to fight close range, because you lose some dmg for it, its nice it would work, not my playstyle but does work =) i would say get creeping curse as well, keeps enemies even longer inside your tornadoes when they jump at you, i wouldnt get both aegis and beads, its way way overkill i think ive only ever needed that kinda defense like twice in my career. if they have hades or ares get beads then i would say either girdle or meditation, med lvl 3 heal is pretty nice for a spot heal and will help more then defense. other then that, more information! [/quote] you actually get more damage with this build than building straight damage because of ao kuang's passive and the book of thoth passive. add in ethereal staff passive combined with the other hp items that give you mana as well and you end up with the most magical power for ao kuang. also it doesnt require you to be up close because of ao kuang's abilities. you just sit outside of a fight and pop tornadoes and squall. also beads aegis is really safe for someone like ao kuang with no real escape. i wouldnt recomend meditation because late game its pretty useless and most of the time you need beads or aegis more than it. other actives you can get would be sprint or girdle i guess. the reason you dont want creeping curse is because you shouldnt be close enough to the fight to be able to use it properly. 14084 Kaden assuming this guide is made to allow you to fight close range, because you lose some dmg for it, its nice it would work, not my playstyle but does work =) i would say get creeping curse as well, keeps enemies even longer inside your tornadoes when they jump at you, i wouldnt get both aegis and beads, its way way overkill i think ive only ever needed that kinda defense like twice in my career. if they have hades or ares get beads then i would say either girdle or meditation, med lvl 3 heal is pretty nice for a spot heal and will help more then defense. other then that, more information! A great build, I will be using this from now on. thanks for the info as well, my ao kuang was really weak but now i think i got it. 13654 2Holo A great build, I will be using this from now on. thanks for the info as well, my ao kuang was really weak but now i think i got it.